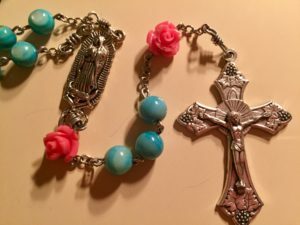 A short discussion of my Rosary roots and my developing relationship with Mary back in my late 20s. Get ready for Lent, and the 100th anniversary of Fatima, but praying the Rosary each day… it’s a way to contemplate Christ. AW 150: The Rosary and Pregnancy — Perfect together! Thank you, Pat! What a beautiful PodCast on praying the rosary as a young mother, and bringing this gift to other mothers and their children. I was one of those young mother’s in your group years ago, and I have wonderful memories of this special time each week with my daughters and many other mothers and children praying together. We would all travel from one house to another each week to pray the rosary and spend time together. I enjoyed when Pat lead our rosary groups, as she often concluded the rosary with the most lovely spontaneous prayers I had ever experienced. My daughters remember this time and remain faithful to God today. Thank you for sharing this sweet memory, may God continue to bless you on this journey.